Many people love the look of sleek, sophisticated look of wood floors. Polished to a high shine, or accented with decorative rugs for a stylish look – many people go out of their way to keep their wood floors in great shape, or fit them into Centerville bathroom remodeling wherever they can. However, bathrooms are usually one place that people avoid placing wood or wood laminate flooring. After all, water can damage both wood and wood laminate flooring – and no room in the house sees more day to day water wear than the bathrooms in your home. However, for those who really want the look of wood floors in their bathroom, is there a way to make it work as part of your Centerville bathroom remodeling without replacing your floors every two years? The short answer is yes – it is possible to enjoy the beauty of wood in your bathrooms, if you’re willing to make some accommodations. You see, in its unprotected state, hardwood flooring is naturally very absorbent. It will absorb water and other liquids that it comes into contact with repeatedly, and for long periods of time, which isn’t what you want long term from your Centerville bathroom remodeling. This prolonged contact with moisture will cause unattractive plumping, warping, expanding and even staining, which will ruin your beautiful (and expensive) new floors. So, the goal with any hardwood flooring in our high quality Centerville bathroom remodeling is to prevent the hardwood’s absorption of liquids. Fortunately, you can do this with a quality finishing agent, usually a polyurethane based sealant. These finishing agents creating an invisible protectant surface on top of the wood, which will allow you to clean up any drips or spills without them damaging the wood. If you decide to go this route, installing hardwood flooring with a protectant applied during your Centerville bathroom remodeling, there are several things to keep in mind. First, the quality of the protectant you choose is very important. You need to choose a high quality finish that is specifically designed to stand up to water heavy environments. You have to be careful when you choose the particular sealant you’ll use during your Centerville bathroom remodeling. Some are marine grade sealants, and some are for outdoor all weather applications, while others are intended specifically for indoor wet use spaces. One of the most important things to keep in mind when applying the Centerville bathroom remodeling sealant is it will only protect the top of the wood. That means if water drains down into the cracks, you’ll get damage from the sides and from below the wood that you don’t want. This means paying close attention to seams in the wood, and apply several coats of the polyurethane sealant you’ve chosen. Wood is a beautiful choice for bathroom floors, and can be integrated into any of our Centerville bathroom remodeling projects. With a little extra effort and common sense, hardwood can be an eye catching design element in any room of your home. 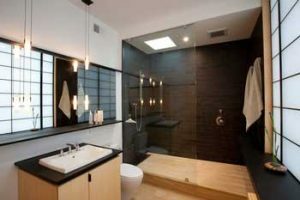 This entry was posted in Blog and tagged Bathroom Remodels, Wood Floors. Bookmark the permalink.